Municipal Solid Waste (MSW), also known as trash or garbage to you and me, is the scientific name for all the things we use and then throw away. MSW contains a wide variety of waste products, from container packaging, to grass clippings, to food scraps. Every year the Environmental Protection Agency (EPA) releases a report which monitors the amount of waste Americans generate and proposes ways to reduce waste, including source reduction, recycling, and composting. In 2013, for example, it was found that Americans generated approximately 254 million tons of trash. On average, one third of this amount was reused or reduced in some way—usually by composting or recycling. Up to an astounding 40% of food ends up in the garbage every year. Most of this waste occurs on farms and in US households. According to the US Department of Agriculture (USDA), an average family of four wastes $1500 worth of food every year. However, the highly perishable nature of some foods (lettuce, for example, wilts after only a day or two) accounts for some hard-to-avoid waste. 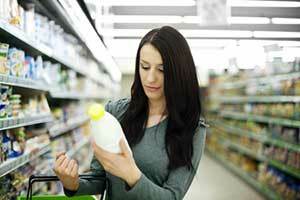 Some perishable foods are packaged in such a way that they are only available in amounts that will never be used. This is one instance where companies could reduce waste by providing a greater variety of portion sizes, particularly for perishable foods. Thanks to the diligent efforts of waste activists, the issue of food waste has gone mainstream over recent years. As a result, the USDA and EPA got together in September 2015 and announced a goal to reduce national waste: both agencies call for a 50% reduction in waste by the year 2030. 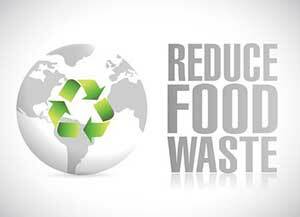 In order to achieve this goal, information on reducing food waste in the home is invaluable. There are number of initiatives that have been introduced in order to better inform the consumer about the safe storage of food and date labels, including apps and consumer education campaigns. Depending on how often you go to the supermarket, track how much you use of each item you buy regularly, and shop accordingly. For example, if you buy an extra-long loaf of bread and half of it is thrown away, next time you’re in the supermarket buy a regular-sized one. It’s tempting to buy as much as you can when you’re out grocery shopping in order to avoid numerous trips during the week, but quite often we don’t eat as much as we think we do, and end up creating unnecessary food waste in the process. When you’re browsing the shelves in the supermarket, there are often products that have longer dates than others. For example, next time you’re out grocery shopping, have a look at the cartons of milk and see which one has the longest date. Lots of perishable goods are shelved in such a way that the ones that need used most quickly appear at the front. This is because stores have their own stock rotation system in place. Now, you don’t want to contribute to the food waste of the store in question, so think carefully about how quickly you will use the product, and choose a relevant date. If you’re buying lettuce to use in a salad you’ll make that night, for example, buy the product that could possibly have the shortest date since you’ll definitely use it on time. Only find the fresher goods when you know you won’t use it immediately. If you’re serious about reducing waste, you won’t want to add to the store’s waste simply to reduce your own, so be aware of this and choose use-by dates that correspond with your meal requirements. When you buy multiple portions of food and are storing them away in the refrigerator or cabinet, store the ones with the longest date on them towards the back. As a general rule, the more perishable something is, the more important this rule is. When you first start doing this, it can be a bit of a nuisance, but when you get into the swing of it, you’ll notice a drastic reduction in the waste produced in your household. Is there sausage meat at the front of the refrigerator that needs used in the next four days? Use it, even if you’re not in the mood for sausage. Don’t plan meals according to what you feel like eating; plan meals according to what needs used up first. If you’re about to go out grocery shopping and still have a small amount of some of the items you buy regularly, don’t buy more! For example, is there half a pack of ham that still needs used? Don’t go out and buy another full pack, particularly if you only use half a pack every week. It’s tempting to shop in a manner that stocks up everything, but quite often other members of the household aren’t as savvy about food storage and usage as you are. If you opt for the new pack of ham, what often happens is that someone else opens the new pack without using the older pack first, meaning that the older pack ends up being thrown away. If you want to reduce waste, reduce the amount that you buy. It’s no big deal if you end up running out of something: you can always go out and get more. This is much better than throwing away food that went off simply because you bought too much. When you buy fruit and vegetables, buy as much as you need. Buying loose tomatoes, onions, and fruit, for example, helps to reduce the amount of food waste. The key to this trick is being familiar with how many of each you use in a certain recipe. Buying loose produce instead of opting for the pre-packaged options allows you to buy exactly what you need. If, for example, you go to the store once a week, and only use 2 onions per week, buying 2 loose onions is a better option than buying a bag that has 10-12 onions in it. There are many other ways to reduce food waste, including preservation and composting techniques, but the tips above are a great way to start reducing your family’s food waste, because they don’t require specialized knowledge or equipment. Anyone can implement the techniques above, and you’ll soon notice how much emptier the trash can is!